You say that youth should be in politics, but most of the youth don’t have the funds to participate in elections. I will appeal to the Prime Minister that something should be done so that poor people can participate in politics without having to spend so much money. In fact, there are already laws that prevent use of money in elections. But it is not just the rules and regulations, it is the awareness that we need to create among the people. We have to go door to door to tell people, do not take money when you are being asked to vote for someone. There is competition, if one gives a Rs.1000 then the other party will also give Rs.1500. Those who go the other way say, "I don’t want to go and vote". That’s a really pathetic state. On one side law, on another side, mass awareness needs to be created. We need to create mass awareness in villages, and awaken people in every village not to take money and sell your vote. Can you speak about the different Devatas and the mantras for each? Mantras are vibrations, so are Devatas and that is how they are related. When Lord Krishna was asked a question, this is what he said, "Daivadhinam jagat sarvam, mantradhinam tu devata. Tan mantram BrahmanadhinamBrahmana mama devata.". The entire planet, the phenomenon of and creation is controlled or managed by them (Devatas). What you see in the gross is only an effect of what is happening in the subtle. So the gross is controlled by the subtle. The world is under the domain of the Devas. "Mantradhinam tu devata" - Devatas are under the control of the mantras. The domain of the mantras are over the Devatas. "Tan mantram Brahmanadhinam", one who is living in the Brahman consciousness, one who is centered, one who is totally in the elevated consciousness, the cosmic consciousness, mantras are under that person. That’s why mantras are such that you cannot take them from books or anybody, you take it only from the Guru. One who is in knowledge, who has the knowledge of Brahman, the mantras work there. And it has to go in that tradition. 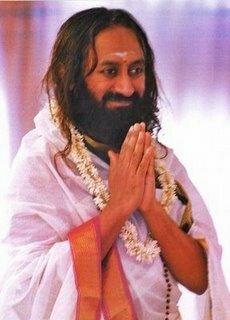 The Gurus give mantra to somebody and tells the person, you go and give, it has the same effect. 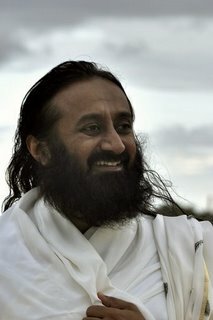 Don’t think, "Gurudev must directly give the mantra", no. 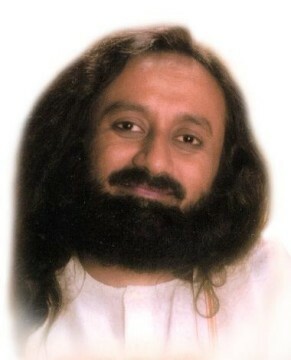 Gurudev can give the mantra through some other people also. "Brahmana mama devata", so the Guru, the enlightened, He is my God. That’s what Lord Krishna says. I want to come to you when you are passing by but there is so much crowd. If I am not running to you, does that mean I don’t have devotion and love? You don’t have to copy anyone else’s expression or behaviour. Wherever you are, I know your heart -- I think sometimes better than you do! So you don’t need to worry about anything. You be relaxed and keep smiling and just ‘be’, that’s all. Keep doing what you need to do, and if you feel like coming to me, just come, no problem. My car goes quite slow and stops. I have no control over my journey as well! If someone comes, I have to stop. I have never ignored any person and gone. It’s not in my nature. I attend to people, as much as I can physically, but otherwise, I do attend to people in other ways too. Other ways are also there. No need for elaborating these things. Some things we should not elaborate, this is one of them. There are many ways you can connect with each other in the subtle. So your smile is good enough! And if you feel like communicating something, you are most welcome. Write it down, send it to me. Jesus gave enlightenment to 12 disciples, Buddha gave to many. How many do you plan to give enlightenment to? I cannot count! I’m not going to count at all, it’s beyond count. This time, the time is quite ripe. They were all in tough times. Now, we are all fortunate, we are in a time which is much more congenial for spiritual evolution. Yoga says, 'We are mind, body and soul', but Buddha says that there is no soul. Then who is a human being? Also, I would like to have some guidance to practice unconditional love. It’s just a matter of saying. If a cup is half full and half empty, someone can say that it is half empty and somebody else can say that it is half full. In Buddha’s time, people already had a lot of concepts about Self, God and everything. This country was full of philosophers and each and every one of Buddha’s disciples were well-read, educated, and a great philosopher. So for Him, He had to take this step of nothingness. "Everything is nothing", that is what He said. To say that it is all nothing, there must be something. Only something can experience the nothing. If I am saying that I am experiencing nothing, then there must be me, to experience nothing. That’s what Yoga says. Don’t look for experiencing unconditional love, don’t seek it, don’t try to experience it. It is beyond experience. It is the existence. So you must simply assume you are in unconditional love, that’ it, period. Don’t question it anymore. The sensory enjoyments are a natural phenomenon. It drains you because it takes your mind outside. But the enjoyment of the soul is when the senses turn inward. In activity, you enjoy things and that has its value. But there you have to spend and spend energy. But when the senses turn inward, there is another type of enjoyment, that is the enjoyment of deep rest. That is the ‘ananda’ (enjoyment) of soul. You can compare the joy of the senses to a candle, the joy of intellect to a torchlight and the joy of self to sunlight! They need not be contradictory to each other, but sometimes when you are stuck with only one thing, then you are unable to look at the bigger picture. For that you need energy.